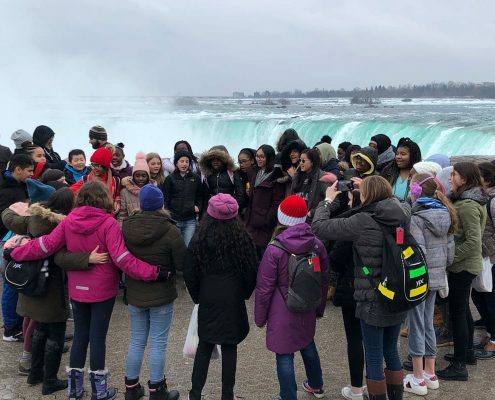 What is it like to be a young person in today’s world? 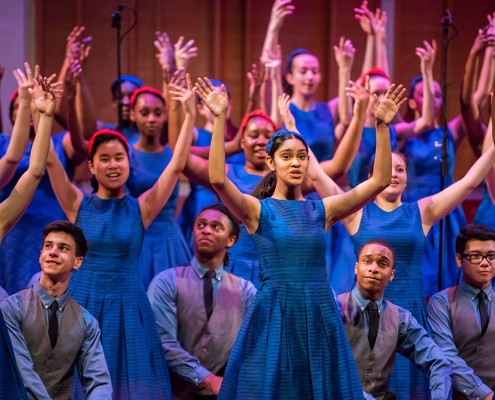 “Vocal Currents: Music in Our Changing World,” a new commissioning series from the Young People’s Chorus of NYC, seeks to answer this question through music. 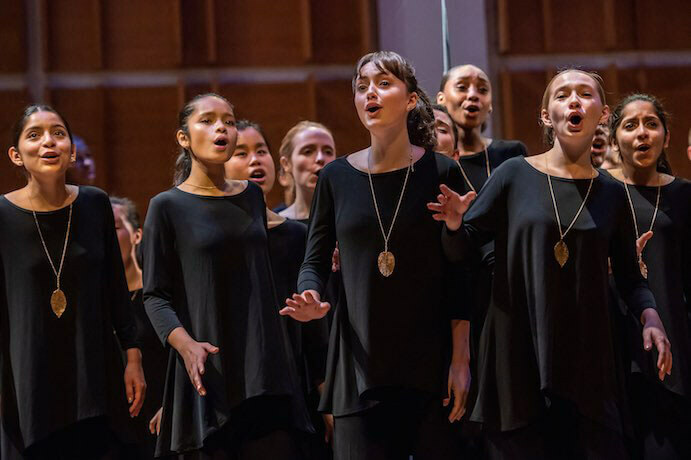 On November 3 at Merkin Concert Hall, YPC kicked off the series with a particular feat of strength: a memorized and choreographed program of eight commissions, five of which were world premieres. As the young singers (11-18) dazzled with their array of talents, they proved not only that musical excellence can be achieved at any age, but also that their voices deserve to be heard. 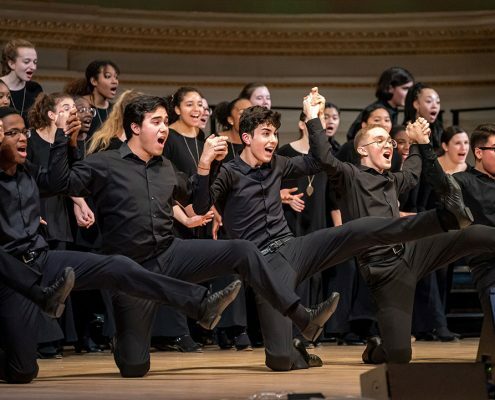 The evening featured works by nine composers, each of whom captured different moments of youth: some quite straightforward, others more abstract. 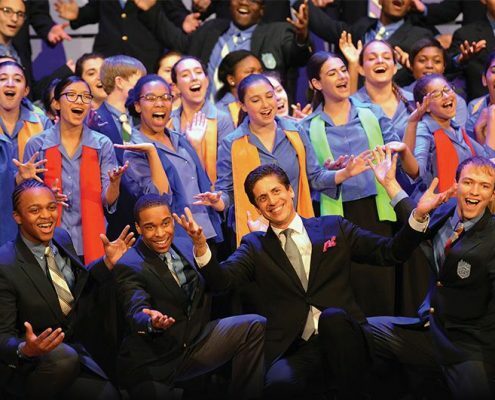 Whether through bluegrass belting, rhythmic complexity, or intricate polyphony, each work challenged the choristers to explore the full realm of vocal production, holding them to a high level of artistic excellence. 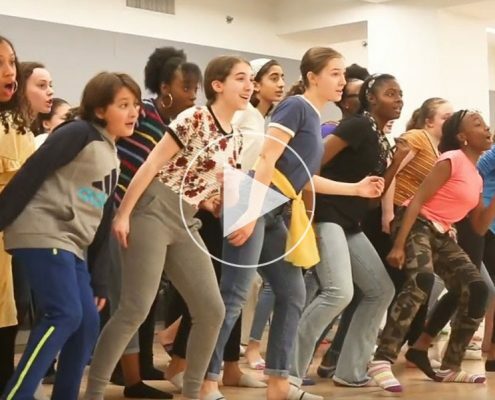 The resulting sound generated by 125 young singers was nothing short of remarkable. A new choral version of Eve Beglarian’s I am Really a Very Simple Person opened the program. Over a gentle guitar ostinato, vocal layers slowly entered and intertwined, expanding, crossing, and forming moments of radiant harmony. Sung entirely on solfège syllables, the textless piece grew from the repetition of simple patterns and enveloped us in a sonic tapestry. Though it was possible to notice individual parts, the magic came from voices working together. Nils Vigeland’s No One is an Island also employed an ostinato, this time embedded within the chorus. Vigeland’s transformation of John Donne’s “No Man is an Island” allowed for greater inclusivity and emphasized the interconnectedness of all people. The setting let the text shine, with the simple ostinato underneath three-part homophony that grew more and more impassioned until a final declarative stomp. 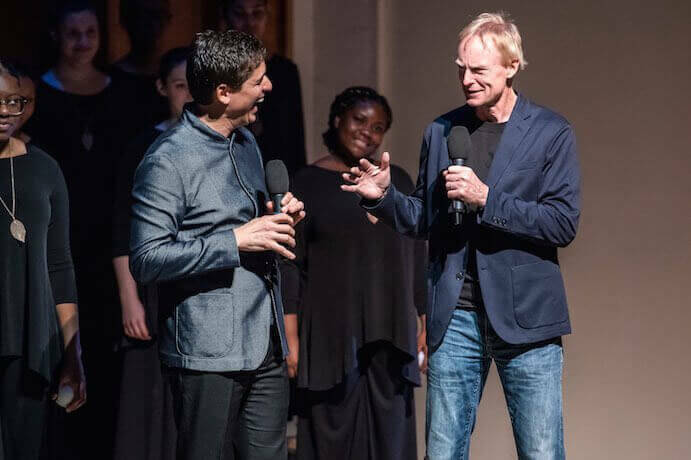 Between pieces, WNYC’s John Schaefer spoke with each composer, giving the audience a window into his or her creative process. 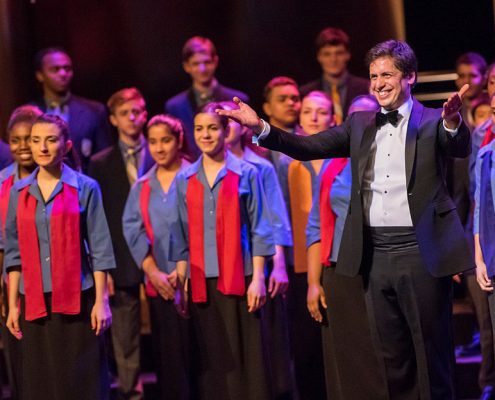 Conductor and Artistic Director Francisco J. Núñez explained that his work questioned the ways young people consider the idea death throughout their lives. 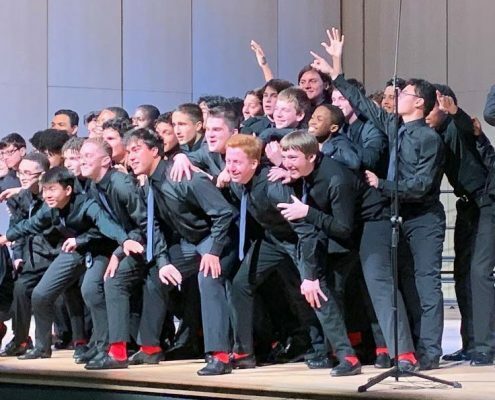 With text by Eric Gamalinda, Liminality grew from a unison wordless melody into overlapping vocal lines that showcased the ensemble’s full range, impeccable diction, and clarity. Each singer held a glowing orb as they moved around the stage in various patterns, mimicking the gentle movement of the music itself. Arturo O’Farrill’s Borderless similarly asked the singers to confront a mature topic, this time issues of immigration and citizenship. The sustained declaration of text (also by Gamalinda) juxtaposed with quick syllabic ruminations (a phonetic exercise by artist Luisa Muhr showing the interconnectedness of language), became multiple lines that ultimately converged. In this way, the music itself offered a possibility for how we may consider our differences. Several works on the program highlighted specific skills of the young singers. Robert Xavier Rodriguez’s Menasherie featured their gift of performance through a clever setting of nine of Ogden Nash’s “Animal Poems.” From the guppy’s sly ballad to the duck’s tango, the fly’s pitched buzzing atop a Bach-inspired harmonization to the porcupine’s spiky screech, Menasherie transformed YPC into nine different theatrical characters. If singing and acting weren’t enough, the singers’ artistic skills were utilized in projections of the animals throughout the piece. 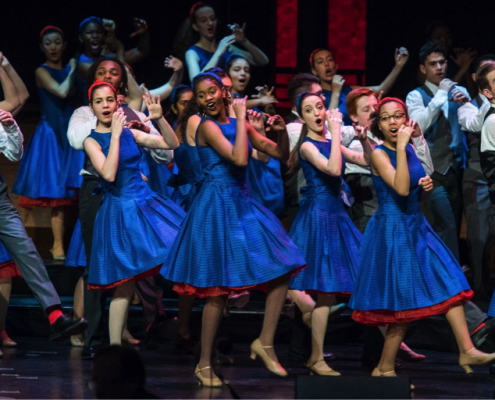 The Young People’s Chorus of NYC had even more to showcase, for their adaptability shined in particularly stylized forms of singing. Yuka C. Honda’s Every Time, Every Tide opened with a unison melody on a bright, buzzy vowel, somewhat akin to a Balkan women’s choir. 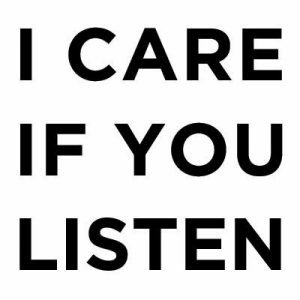 Each repetition added new counterpoint and various vocal effects—slides, vocal fry, and audible inhales. After a more text-driven section, vocal fry and ascending glissando resulted in the final “yah,” repeated in bold, bright unison, shouted with arms flapping in pure joy. Tim Sharp’s I Don’t Need No Man took us to the hills of Appalachia, in a quasi-#MeToo up-tempo folk number. Backed by a bluegrass band (Sharp himself on banjo), YPC demonstrated their folk-tinged sound in a catchy melody complete with close harmony in thirds. They proved even more talents when they broke into a surprise choreographed dance number that was remarkably precise, especially in such complicated steps on a packed stage. The evening ended with Eve Beglarian’s Armon, a modular work that again utilized wordless overlapping patterns. A spoken excerpt of an eighth century prayer by female mystic Rabi’a provided a soothing warmth that faded into the continuously rotating sonorities and intertwining colors. In an evening that showcased the voices of young people, it was impossible not to marvel at their openness to experimentation, commitment to excellence, and immense array of talents. 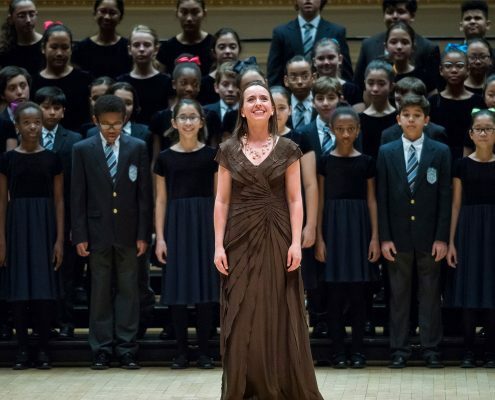 For as the Young People’s Chorus of NYC sang “I am alive in this moment” in Núñez’s Liminality, it became clear that if they lead the future of music, it calls for nothing but celebration.